Australia coach Graham Arnold remains proud of his Socceroos despite a cruel Asian Cup quarter-final exit. Arnold's men fell to a sucker-punch from host nation the UAE in Al Ain, with central defender Milos Degenek's horror second-half mistake gifting the Emiratis the only goal in Saturday's (AEDT) 1-0 loss. There appeared little danger when Degenek attempted a backpass to goalkeeper Mat Ryan in the 68th minute of a game Australia had controlled for large parts. But the 24-year-old's pass was short and UAE striker Ali Mabkhout nipped in ahead of Ryan to steal the ball and score into an empty net. The goal was a double blow, coming minutes after Australia thought they'd taken the lead when birthday boy Apostolos Giannou finished after combining with substitute Mathew Leckie. Leckie however was flagged for offside in the build up and Giannou's goal was ruled out. Despite the defeat, Arnold was full of praise for his young team which had overcome pre-tournament injuries to Aaron Mooy, Daniel Arzani and Martin Boyle to reach the last eight. "Football can be a cruel sport. It's probably the only sport in the world that you can control possession, you can have much more possession, can have more chances on goal, you can spend more time in the opposition's half and you can still lose," Arnold said. "I think that we've done very, very well this tournament. "The whole frontline for the first three games had less than 10 games between all three of them. "A couple of players from the A-League have stepped up in Rhyan Grant, Chris Ikonomidis, who hadn't played before. "I'm very, very proud of this group of players. They gave their all and that's all I can ask." 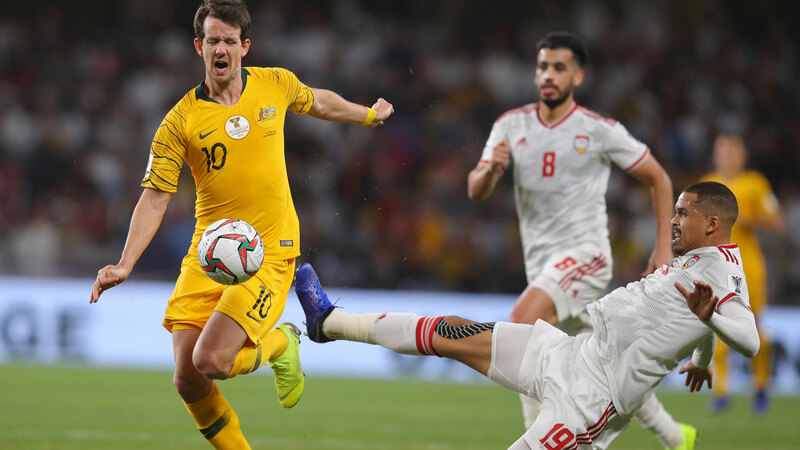 After a frustrating round of 16 display against Uzbekistan that went to penalties following 120 goalless minutes, Australia began brightly at a packed Hazza Bin Zayed Stadium. With Tom Rogic suspended following a harsh booking against the Uzbeks, Arnold changed his formation and picked Giannou alongside Jamie Maclaren up front with Robbie Kruse earning a recall to the starting line-up on the left. The UAE threatened on the counter, particularly through pacey winger Ismail Al Hammadi who forced Mat Ryan into one good save after bursting through Australia's defence. But largely it was the Socceroos in control with Giannou - the man who went from injury replacement for Boyle to starting striker in three weeks - leading the way. The introduction of Leckie, Andrew Nabbout and Awer Mabil was Arnold's attempt to force a goal but - for the third time in five matches this tournament - Australia drew a blank. "The style that we expect to play takes time," Arnold said. "You've got to remember I've been in charge only for four months. I've only had eight games with these boys. "The style is completely different to what they've ever played." Australia now head home to begin preparations for the first round of 2022 World Cup qualifiers starting later this year while the UAE head to Abu Dhabi for a semi-final with Gulf rivals Qatar on Tuesday.